Our Hyperbaric Consignment Program specializes in helping people sell their used hyperbaric chambers and oxygen concentrators quickly and easily. All we charge is a small fee based on the transaction. No money ever comes out of your pocket. Fully certified and insured, we do all the work for you, from our 21-point inspection, to reconditioning, to negotiating the sale and shipping your chamber. We even offer a warranty on your chamber! Remember, a hyperbaric chamber is medical equipment and requires a durable medical equipment (DME) license to sell. Speak to our hyperbaric specialist and let them help you determine the worth of your chamber. Our team and Dr. Hilliard have over twenty-five years of experience, so we can help you determine a realistic price point for selling it quickly and easily. 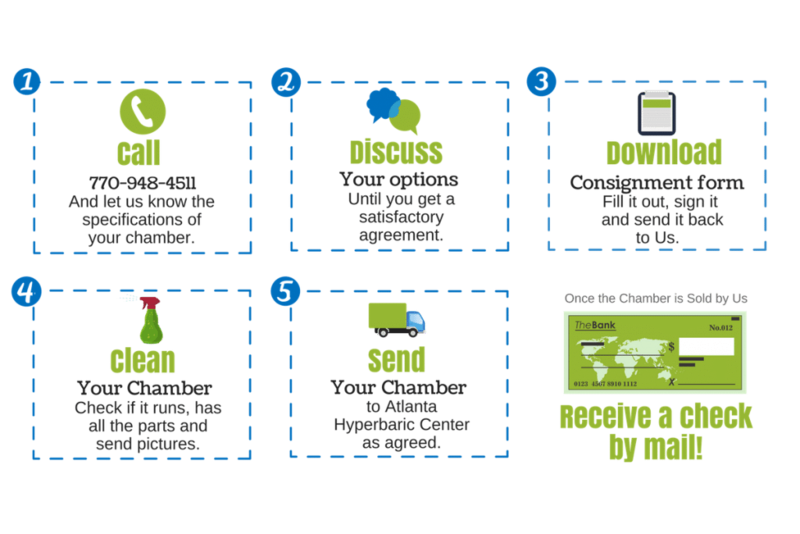 We have multiple sales platforms for selling your chamber anywhere around the world. All advertising and promotions of your chamber are a free service to you. People who want to buy hyperbaric chambers call us every day! To help you with your sale, we offer a FREE WARRANTY on our used chambers if they pass our 21-point inspection of the zipper, welds, windows, valves and other components to make sure your chamber is functioning correctly. It’s easy to sell your chamber with us. Just call us and we’ll get you the best deal. We’ve helped hundreds of people sell their hyperbaric chambers after they’d healed or didn´t need them anymore. Don’t get yourself in trouble: Many people don’t know that hyperbaric chambers are medical equipment and require a durable medical equipment (DME) license to sell. We’re fully certified and insured. 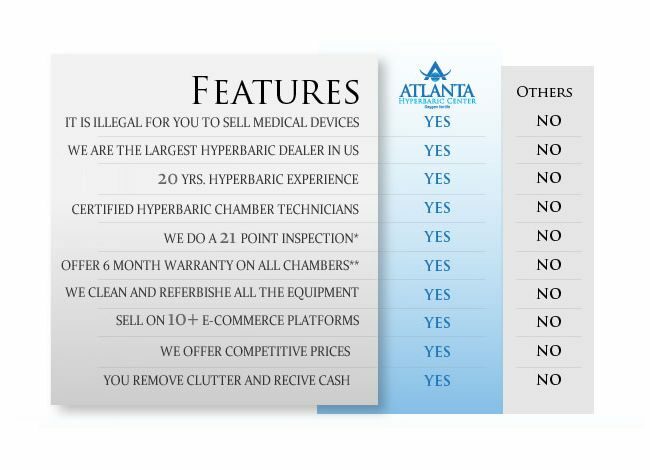 At the Atlanta Hyperbaric Center, selling your hyperbaric chamber once your condition has improved and you no longer need it is very convenient. We do all the work for you, from our 21-point inspection, to reconditioning, to negotiating the sale and shipping your chamber. Thanks to our Consignment Program, more people get access to the benefits of HBOT at a more affordable price.